[AUTO](RC):When placed, COST [Counter Blast (1) & Soul Blast (1)], look at two cards from the top of your deck, put them on the top of your deck in any order, and draw a card. 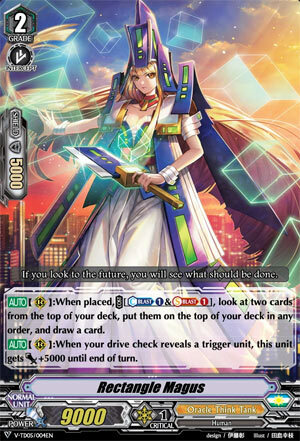 [AUTO](RC):When your drive check reveals a trigger unit, this unit gets [Power]+5000 until end of turn. Finally free from the Manga-only Hell. Rectangle Magus seems to be a decent mainstay if you’re absolutely not confident in a free scry just doing the job. i mean, don’t you draw enough already in OTT? Also not a fan of the fact she gains 5k power, not 6k so she can scale to Force rear-guards. That’s a bummer. Probably relegated to the Magus deck since Amaterasu basically is this except more soul friendly. And CC is hard to come by. Still not bad though.